Just walked into a badger looking for forest robbers with ~30% encumbrance from snow and armor, and had him decide to attack me. Entered the map tile very close to him, missed my first javelin (from the high penalty, he should have been toast...), tried to throw a second without wielding it, and he took advantage of my turn penalty to give me a 20% injury Serious Tear in my unprotected left eye, which I tend to imagine as a very badassly-permanent injury. 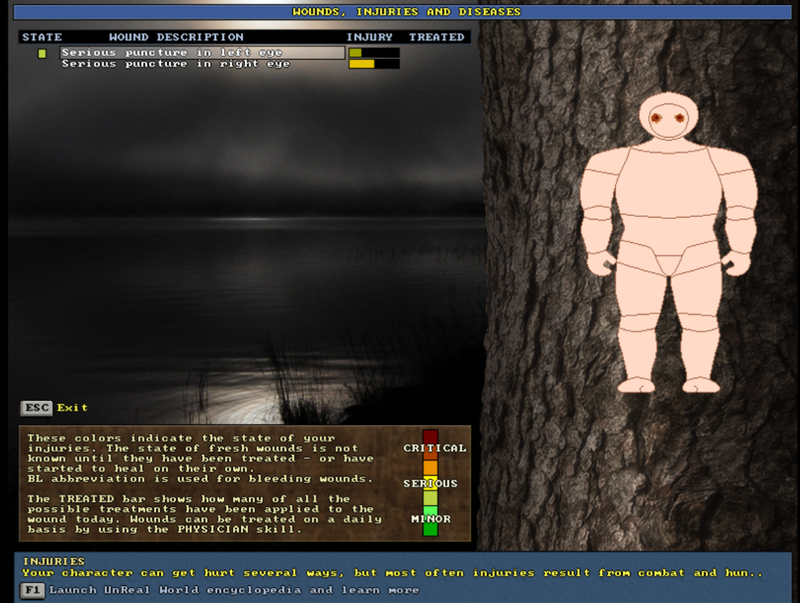 Flailing with a hastily equipped handaxe, I missed three more attacks against him, answered by failures to penetrate my armor, and he ran off into the forest, unhurt, and without having broken a sweat. I had to limp home in embarrassment, unfit to fight bandits. On the topic of bandits, the ones I'm looking for are Owls in Kaumo lands, and the quest givers were super racist about their tribal affiliation... Makes me wonder if the Reemi I usually trade with are thinking of me as "one of the good ones" behind my back, since I'm a foreigner in their lands. Anyone else notice this with other tribal combinations? I got into a scuffle with a bunch of pigs out in a bog, all while I had a boat strapped to my back. I don't know why but I found it really funny. I was on my way to a distant village to see their sage, and the best way to get there is to carry my raft across a wide open bog to a lake, paddle across the lake and then up a river. Well on my way across the mire, I ran into a herd of wild pigs. Seeing an opportunity, I tossed some javelins into the herd, lightly wounding one of them. I spent the next several minutes chasing pigs all over the swampy morass, eventually wounding another one and separating it from the rest of the herd. I was still carrying the heavy raft during all of this, since I didn't want to drop it and forget where I left it during the chase. My character was tired, and I was trying to line up a killing throw against that isolated, wounded pig. Right at the exact instant I was ready to throw, I took a heavy blow from behind me. It made me jump in my chair. One of the other pigs had separated from the herd, charged me and rammed itself right into my backside! I didn't even know they could do that (I'm still fairly new to this game). It knocked the javelin right out of my hands. It kept attacking me as I frantically pulled out my spear, and it caused a pretty serious injury to my arm along with some minor ones. For a minute I thought I was gonna get torn apart by pigs, but I managed to stab it and it took off running. I turned around and continued the chase against the other wounded pig, and even though I was injured and over-encumbered, I managed to keep up with it until it had exhausted itself, then finished it off. The mental image I had of my big burly Kaumo guy chasing and getting knocked around by pigs while running through a bog with a boat strapped to his back made me laugh. Thoroughly bored with my 1 year+ Driik huntsman-trapper and yet curiously inspired by your example, I set off to prove my heroism by KILLING a large game animal with a raft. First I built myself a raft, then tested m skills. 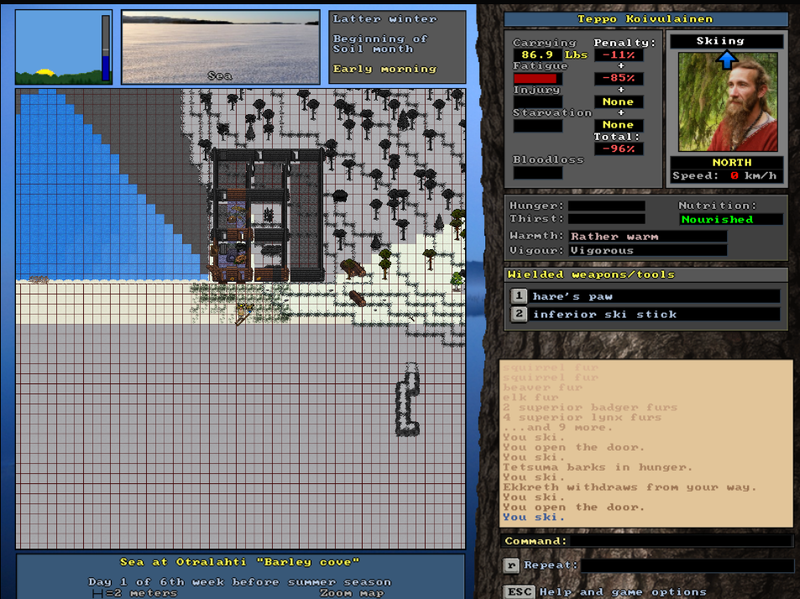 As I could only throw a raft a single tile and I am not quite so masochistic as to try to run something down with only a raft as a weapon, I decided to use a crossbow to injure the animal and THEN run it down. It took a fair few attempts and a couple lost broadheads to do so as a raft is quite cumbersome, but I eventually crippled a nice, large elk and then ran it down. Be forewarned, would-be champions of raft combat: A raft makes a thrown rock look like a horrifically deadly weapon. Thrown rafts evidently can merely scratch a beast, and cannot even penetrate elk-hide over much of an animal's body. So I spent several hours throwing my raft at the beast. So herculean were my efforts that the ferocious crippled elk once regained consciousness after an initial downing and started trying to run away again! It took me many minutes of chase to catch up and thwack it enough times with my raft to bring it down again. Eventually I decided that the beast's skull was simply too thick and well-armored a target and thereafter went for body shots, hoping to score a lucky strike against thorax or abdomen. Armed with this knowledge, I finally slew the tasty yet dastardly beast. But my learning was not yet complete! For it seems that a full set of armor AND a raft make skinning and butchering such a beast so tiresome that I needed to rest and even sleep several times before I finished. Fortunately, it seems that raft splinters do not greatly damage animal hides, no matter how severe the beasting. And that, friends, is my tale. Now if any animal rights groups come asking, please give them a false name and point them in some other direction, thank you. Unusual Njerpezit encounter... saw one on the zoom-map and went after him. Had my first ever livestock loss today. Went off to mess around hunting and fishing at my lakeside kota, leaving my little flock of sheep back at the cabin. When I returned a couple weeks later, a lynx a broken in and was feasting on the remains of a murdered sheep. Can only imagine the horror of its flock-mates watching their kin being slowly being devoured...while penned in with the monster. I haven't been playing long, still on my first character. I finally found a spot I wanted to try settling and started clearing out timber to make a small house. Before I got any actual building done, the first snow fell and I decided I don't have time to finish a house before winter hits, so I cleared out my cellar, checked my traps one last time, and began migrating back north toward a cave I left behind during the summer. So far none of my pit traps have managed to produce any game, even after I baited them with turnips. I'm having better luck with light lever traps; I've actually snagged a few grouse with those. Other than that I've been surviving on fish I'm catching and various foods purchased from the many villages that I've visited. I am sooooo not ready for winter. I will probably die. The raw meat is currently sitting in the cellar I just finished building. Hope I can build that fireplace and start smoking meat before it spoils... I have no idea when I'll be able to dry meat; I'm currently on day 1 of 2nd week before winter season. After discovering that the cave will apparently not function as a smokehouse as it stands, I hauled my catch to the nearest village and borrowed the use of their sauna. I will return for my bounty in a couple of weeks; in the meantime, I am building walls in my cave to enclose the fireplace. This is proving to be a pain in the rump due to both the exhausting nature of building even a single wall and the absence of any reliable lighting besides the fireplace itself. I guess I'll try shoving more wood into it so it will burn longer. I would like very much to make this work so I can turn my attention to the business of extending my trap fence. There appear to be loads of reindeer wandering the grounds. Also this is the same character from my badger story, he has yet to be seriously injured anywhere but his eyes, and he's killed exactly 30 Njerps in the last week of in-game time. I'm tracking my data as a kind of census to help establish the range, details thus far in the population thread. The toughest squirrel I've encountered. Shall we call it a... wait for it... R.O.U.S. (Rodent of Unusual Strength)? I find ridiculous how numerous they are, no matter if their equipment is basic (handaxes, knives) or their skill is low they don't seem to flee if you kill one of their buddies or severely injure one of them and at the end they'll manage to knock you out soon or later, I wish there is a way to remove them in my playthroughts since I have more a lone wolf playstyle. Here in the UnReal World: more guys > gear & skill. I haven't played in years upon years I had purchased a lifetime registration.. feels like probably 10 years ago! And just remembered URW last week. Suffice to say, I've been binging. I was just out checking traps with my dog and hoping to stumble across an elk or other large game. Finally set up to smoke meat we set out across the mire. Elieurnan, my wee pup, had been with me for two months now, taking up food and scaring off wildlife - but also proving incredibly useful, and much more loyal than expected.. IRL, my dog couldn't give two buffalo chips about listening to me when he sees a rabbit or other game.. but Elieurnan had become a very loved animal to see chasing me around and killing multiple lynx and badger without getting injured. When we arrived in the small lakeside trapline I had set up while the snow cover was thick enough not to realize the mire prevented purposeful farming, there was a grouse stuck under one of the lever traps that I maintained - a loose word, as due to distance I didn't bother baiting them and we only ever checked them when heading to one of the nearby small villages. Excitedly, I figured that this was an opportune chance to try and get some practice with my bow. It's hard to justify breaking arrows shooting at logs, but some live meat is completely different. The arrow hit him in the heart. He died within minutes - which, being turnbased, means I've just spent 5-10 minutes trying to figure out if I can somehow save him... tabbed back in, and dropped some food..
"Eat now, Eliurnan", I said in a hopeful, hushed tone. He looked at the meat, and back up to me with a happy look on his face ... and a wiggle in his tail .. then collapsed, the blood pouring from his torso. Devastated, I've decided that it's dog for dinner. Also URW is even better than I remember it was so many years ago! So incredibly happy that development kept up and has created this pristine gem.. beautiful game! ED: Got a fine dog-skin.. fitting, from such a fine dog! Went to a Sartola village nearby to sell the meat of a freshly killed bear, and popped by the cattle enclosure to say hi. So I skinned it, butchered and sold the stuff to the villagers. They should have done it themselves though! I started a new farmer/trapper character, a Koivulainen with decent rolls and skills. It's full winter and I'm enjoying my cabin in the no man's land northeast of the Koivula lands. I've also, for the first time, started using multiple trapping sites instead of only trapping near my cabin. Not sure why I never did it before. Essentially, I put 3 fox traps at the north bank of many 1-tile lakes, within 1 day walk of my cabin. I also put a shelter, a tree trunk and a rock there (to process the hide). Every round trip I've made so far, I brought home one or two fox furs. Since it's working so well, I'm going to add one small deadfall to each camp and see what I get. I'm also curious if different terrains will yield different animals. Right now I have coniferous, heatland and I think spruce mire.